← Why can’t I sleep? After all, I’ve committed no crime. So we drove on towards death through the cooling twilight. I reread The Great Gatsby because of the Baz Luhrmann film. Sometimes I find films can affect how I read books – a film’s interpretation can overwhelm the text stripping a myriad possible interpretations down to just one. I didn’t want when next I read the book to see Leonardo DiCaprio as Gatsby, Carey Mulligan as Daisy. The danger seemed all the greater given I like both actors and both seem to me quite astute choices for their respective parts. As it happens, I still haven’t seen the film. That’s ok though, because any reason to reread a book as good as The Great Gatsby is a good reason. 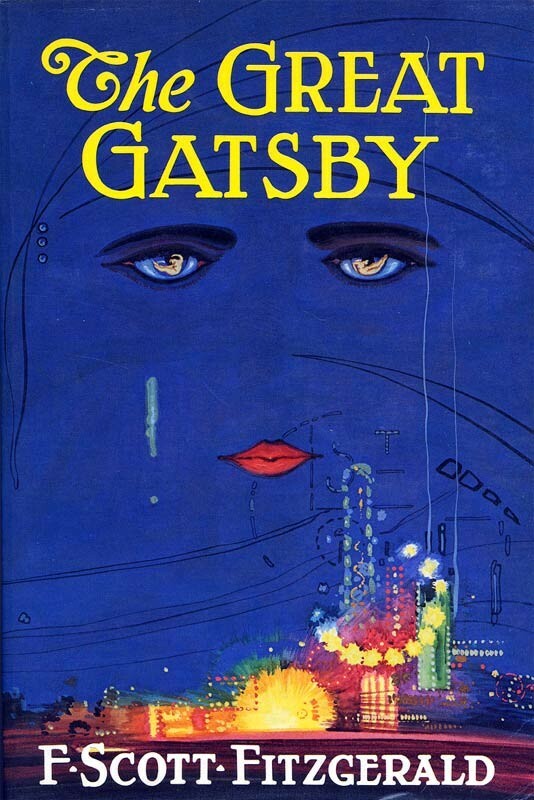 That’s the original cover, so loved by Fitzgerald that he wrote it into the book “I had no girl whose disembodied face floated along the dark cornices and blinding signs,”. First off, The Great Gatsby isn’t about any one thing. Ten bloggers could write ten pieces about it, each with their own take, and what’s more they could all be right. That’s part of why this is genuinely a great book. In under 200 pages it contains multitudes. For me, on this reading, the key themes were mortality and money, but on another reading I could well come back with something quite different. Nick Carraway is a comfortably off young man just starting to make his way in the world. He’s a veteran of the Great War, now working in bonds in New York. He lives on Long Island in a small house next door to a vast mansion which hosts extraordinary parties to which much of fashionable New York and the eastern seaboard appear to be invited. His place isn’t much to speak of, but it does have “the consoling proximity of millionaires”. Nick’s the narrator, but here’s the thing – he doesn’t narrate events as they happen. He narrates in hindsight, everything he speaks of is already gone. Everything that follows needs to be read in that light, as something past and receding into memory. Over the water live Nick’s old college friends, his cousin Daisy and her husband Tom Buchanan. It’s because of them that he meets his neighbour, Gatsby, who loved Daisy years past and has kept her image inside him. Gatsby has only built his huge mansion so that he can live opposite Daisy. He only throws his parties in the hope that she might come to one. Gatsby is enthralled to a love that’s long since slipped from his grasp. Soon Nick is part of their charmed circle, a friend to Gatsby because Nick is a route back to Daisy. Nick though is an outsider in their world, present only by chance. Gatsby and Tom Buchanan are both extraordinarily rich. Daisy grew up with money and has since married it, she knows Tom has affairs but she doesn’t leave him. Daisy and Tom are insulated from the world by Tom’s money, settled now in Long Island but with no great attachment to it or any other place. They had spent a year in France for no particular reason, and then drifted here and there unrestfully wherever people played polo and were rich together. The other member of their little group is Jordan Baker, a professional golfer, Daisy’s friend and for a while Nick’s girlfriend. Jordan doesn’t have the money that Gatsby or Tom do, but she has celebrity. Nick merely has a job. If it weren’t for his connection to Daisy these people wouldn’t look twice at him. Sometimes she and Miss Baker talked at once, unobtrusively and with a bantering inconsequence that was never quite chatter, that was as cool as their white dresses and their impersonal eyes in the absence of all desire. They were here, and they accepted Tom and me, making only a polite pleasant effort to entertain or to be entertained. They knew that presently dinner would be over and a little later the evening, too, would be over and casually put away. There’s a tendency for people to assume that Daisy is a great beauty, a stunning creature who inspires overwhelming passions. The text though doesn’t support that. She’s certainly pretty, but so are a great many women of her set. She is a bright and attractive young woman of the upper middle classes who married well. Her charm is in part born of the utter confidence of never having to work, never having the slightest financial concern. Her voice is perhaps her best feature. Nick tries to work out quite what makes her voice so special, then it finally clicks – ‘Her voice is full of money’. Fitzgerald captures here a truth of the jazz age. Most people never lived it. This is lifestyles of the rich and famous, 1920s style. It’s a collision of money and celebrity, washed down with champagne and soundtracked by the hottest acts of the age. Even as it’s lived it’s fleeting, and that’s part of what makes it wild because everyone knows the parties can’t last forever. Daisy is drawn back to Gatsby, now as rich if not richer than Tom. She’s discontented, bored, and Gatsby returned is something new. The summer accelerates into disaster, Gatsby, Daisy, Tom, Tom’s affair, all an onrushing car crash that leaves shattered lives in its path. I talked above of how Nick is an outsider, but Gatsby is too of course. The book is full of people hinting as to how he made his money, but in 1920s America the truth is it doesn’t need spelling out how a man comes from nowhere to a vast fortune. Nick describes Gatsby as “an elegant young roughneck, a year or two over thirty, whose elaborate formality of speech just missed being absurd. Some time before he introduced himself I’d got a strong impression that he was picking his words with care.” Gatsby is a showman, an imitation of a man from Daisy’s world. It’s not for nothing the book’s titled “The Great Gatsby”, with the impression that carries of Gatsby as a circus act. Gatsby is also a gangster, an oligarch, a man of great fortune whose origins don’t bear examination. He’s obsessed with Daisy, but Daisy is in some ways more than a person to him, she’s a symbol. Daisy was the first rich girl he ever dated. That’s what made her so special. She was an ice cream on a hot day, and an emblem of an America beyond his grasp that yet he did briefly hold in holding her. That’s why it’s a mistake to think that Daisy is especially desirable. She’s vital to Gatsby because of what she was to Gatsby, money and class in a summer dress. Gatsby is driven by nostalgia. He’s chasing a dream which he’s clothed in Daisy’s flesh but it’s not truly Daisy, and she’s not really the girl he remembers. If Gatsby were poor Daisy would never consider preferring him to Tom. Gatsby knows that, it’s partly why he’s not poor any more. In the classic Anglo-American 19th century novel money dominates all. This is a pre-social security world, one with no safety net. The concept of ruin is often interpreted morally, and that’s part of it, but it was also profoundly fiscal. A family that fell into ruin could no longer support itself. That’s why 19th century fiction is so obsessed with incomes and dowries. I was immediately struck by the number of young Englishmen dotted about; all well dressed, all looking a little hungry, and all talking in low, earnest voices to solid and prosperous Americans. I was sure that they were selling something: bonds or insurance or automobiles. They were at least agonizingly aware of the easy money in the vicinity and convinced that it was theirs for a few words in the right key. That captures in a paragraph the decline of the UK and the rise of the US. The sweeping away isn’t complete though. There have always been Toms and Daisys, securely wealthy and sailing above change (just as their descendants continue to sail above it near a century later). Gatsby’s emerge, they occasionally manage to join the elite, but whatever happens to the new pretenders the old elite never entirely seems to fade away. The Great Gatsby becomes then an almost forensic examination of new and old money, and of the extraordinary power of money. Tom and Daisy are rich enough to buy off consequence. They harm each other in part because nothing else can harm them. Us against the world only makes sense when the world isn’t already set up to your benefit. Above all else, The Great Gatsby is a superbly written book. I could easily fill this piece with quotes, and what’s more with incredibly relevant quotes like the one above, which is the book in miniature. As an exercise in prose this is high art, and made all the higher by its richness in themes (most of which I haven’t even touched on) and the strength of the characters. At the same time, it’s acutely well observed, with a sharp sense of the physical and capturing small details that other novelists wouldn’t even think of let alone describe (I particularly liked how in one tense scene Nick is distracted by his underwear “cimbing like a damp snake around my legs” and of how “intermittent beads of sweat raced cool across my back” – that’s the kind of absurd detail that intrudes all the time in real life but very rarely in fiction). I’m going to end on one final image, one that captures for me the book’s fascination with wealth. The word glamour used to mean a form of magic, a sort of illusion which seemed more real than reality itself. A glamour was a vision put by a faery or magician upon a thing to make it seem beautiful, desirable, better than muddy reality. The green light is a glamour. Daisy too is glamorous in this sense, made magical by Gatsby’s memories of her but all the more by her husband’s wealth which keeps her free from the world and her own part in it. A belle dame sans merci. Daisy, gleaming like silver, safe and proud above the hot struggles of the poor. I’ve avoided reading other reviews while writing this, as I wanted to first get my own thoughts down. Here though is a piece by Sam Jordison of the Guardian about the role of mortality and the fleeting nature of experience in the novel. Here‘s another excellent piece on what makes Gatsby great, by Sarah Churchwell who recently wrote a well-received book on the Fitzgeralds, and here‘s the first of two tremendous pieces by Lorinda J. Taylor about metaphor and symbolism in the novel (a subject she’s much stronger on as a rule than I ever am). Lorinda’s pieces are quite long, but I do urge you to read them anyway – they more than repay the time required. Finally, here is a link to one of the odder things on the internet, an NES computer game based on The Great Gatsby. You can play it directly online at this link, and you too can see if Nick can survive Gatsby’s party and the threat of newspaper boys and charlston-dancing flappers. Seriously, follow the link, it’s deeply strange. When I heard about the new film version, I also considered rereading the book for the very reasons you mention. I’m not in a hurry to see the film, so it still may happen. You make some excellent points here about the various readings of the book which shift with each encounter. This is a quintessential American novel with it emphasis on wealth and the shifting morality of wealth and I can’t imagine it written by someone of another nationality. I didn’t know that this was the original cover–some great new covers have appeared. The Alma Books advertised on Amazon looks like Wodehouse. It is a quintessentially American novel, I agree Guy, and I think that’s part of its strength. It expresses something of the time and place it comes from, and yet becomes universal as it does so. I rather like that Alma Books cover, I read a Vintage Classics edition on my kindle though. I just put the cover above because it’s interesting and comes with a story. Stu, I haven’t seen the Redford version. How do you reckon it? I actually considered a paragraph about the contemporary parallels, which is why I use the word oligarch at one point, but it didn’t fit well so I cut it. As you say though, it definitely embodies something of our age too. A certain gilded sensibility far away from the dust most people have to live in. We picture periods by their exceptions. When we think of the ’60s most of us think of hippies, flower power, the counterculture and all that but firstly that only happened in a handful of countries and secondly even in those countries most people had nothing to do with it. I’m a fan of the old SF show The Invaders, set in the ’60s when it was filmed. It touches once on the counterculture (unfavourably), but otherwise it’s just not really mentioned. I’m rewatching Bewitched at the moment. No mention of it. Dragnet (admittedly a right wing show in terms of its politics) mentions it only occasionally in passing (and again negatively). When you watch the tv of the period it’s almost as if they don’t know they’re in the ’60s, because of course in a very real sense they’re not – we construct that about them later. Similarly in the ’20s most people are not really living in the jazz age. It’s something they occasionally read about in the newspapers. Fitzgerald gets that where many other writers don’t. Thank you for this refreshing review of one of my favorite novels. The Great Gatsby has been rightfully named the Great American Novel for its critical social commentary, but it actually reminds me of the Great Russian novel, The Hero of Our Time. Jay Gatsby and Grigory Pechorin both portray the ultimate anti-hero, an amalgamation of all the corruptions of their respective generations in the richness of their preeminence. Both novels initially present romantic stories, which later develop into gloomier cautionary tales of unscrupulous influence and vices. The Luhrmann film, in my opinion, is worth seeing. It takes a few liberties with the book in an attempt to give it a modern twist. Many have compared this film to the 2012 version of Anna Karenina by Joe Wright, criticizing it for its glossy look and fast paced development. I, on the other hand, thought that the character development was well captured and none of the stars outshined one another. I enjoyed the modern day themes and music and thought the visual symbols were representative of the grotesque weakness of Gatsby’s society, which was filled with manipulative characters who struggle to exude power over others. I would be curious to learn your opinion on the film, if you choose to see it. I haven’t seen the Luhrmann film. Don’t really want to. The abiding memory I have of the book is ultimately of emptiness, fragility and deception… but in a good way! And I don’t believe that Luhrmann has the skill or understanding to carry that off. I want to reread this for the very same reasons like you. I suspect the movie will alter my view of this considerably. At the same time it’s a reread I?m dreading as I loved some of te images in this book so much that I’m afraid rereading will alter that forever too. I still read your review and I’m very interested in what you say about it being so rich that everyone takes away another novel. That’s truly the sign of great literature. I guess I have to get to it sooner than later now. Do you like his other novels as much? I’ve read pretty much all of him at one point but I only remember this. I can’t remember, have you read The Grand Meaulnes? After all that’s where the title of The Great Gatsby comes from and for me these two books use the POV of peripheral 1st like no others. And there are other similarities. I know Emma hates Le grand Meaulnes but she likes this, so I would be intereted to know how you feel. Nice review, Max. I read ‘The Great Gatsby’ many years back and I don’t seem to remember much of it now, except for the basic storyline. When I look at the edition of the book I read, I see a lot of highlighted lines, which just means that I have to read the book again to appreciate it better. Thanks for this wonderful review. I enjoyed reading your thoughts on the themes explored by Fitzgerald in the book. Sirensblog, any reference to Pechorin is obviously alright with me. Interesting comparison, and not one I’d have thought of, but you do have a point. I do plan to catch the Luhrmann film at some point. I don’t believe it will capture the fragility and emptiness that beautifulorange rightly speaks of, but films shouldn’t try to be too faithful to the book I tend to think but rather inspired by it. Still, I don’t expect it to be a five star movie as it were. What did you make of the Joe Wright Karenina? I’ve not seen it yet as I’ve not read the book yet, but while the reviews said it was flawed I thought it interesting that he tried to do something different from traditional cinematic techniques. beautifulorange, emptiness, fragility and deception, definitely. I agree that Luhrmann isn’t the director one turns to for those kinds of emotions, any more than say Zack Snyder would be. Caroline, I need to revisit them as I read some long ago and can’t now recall which. I don’t know The Grand Meaulnes, though we may have a copy courtesy of my wife (though if so it may be in French, as she tends to read in the original language where she can). Vishy, the storyline’s the least of it, it’s the wonderful prose and atmosphere. Reread it, it’s a definite rereader. “now working in bonds in New York” – to think, this was once a respectable profession…. From what little I’ve seen of it, the Luhrmann film gets almost every tonal element of Gatsby wrong, but it’s his prerogative as a film-maker to interpret the text as he will. I recently read Tender is the Night, which is much more bitter and cruel, and more explicit about the impersonal power of money (or its absence) to wreck lives and dreams. Have you read The Good Soldier? It is always yoked to this book in my mind, as I read and re-read both in proximity many years apart. Very interesting to compare the sophistication of the narration in both with the apparent simplicity of its presentation. Your point about Daisy is well-made and I think much-overlooked (by me as well) – “She was an ice cream on a hot day” – fantastic way of summing up the nature of Gatsby’s obsession. The Churchwell book is a strange one. The article you link to was (I thought) excellent, but I’ve seen some quite critical reviews of Careless People. It seems at least possible she has uncovered an original and interesting background nugget, but then over-played it in making it drive the whole book. I just bought The Good Soldier the other day funnily enough, I’ve not read it or any Ford Madox Ford. The thing with Daisy took me aback slightly, because the text wasn’t as I expected. I saw people saying that Carey Mulligan wasn’t right for the part in the film as she wasn’t beautiful enough, too girl next door. Daisy though isn’t beautiful, not in some supermodel way anyway, she’s simply pretty and incredibly self-assured. The film does sound like it’s tonally out as you say, but I still think the casting of Gatsby and Daisy looks right to me. Less persuaded about Tobey Maguire, who I thought made a great Spiderman and, well, he made a great Spiderman. Glad you liked that line, I wasn’t quite sure about it. Doubt I’ll read the Churchwell group even if it is good. I’m rarely interested in author’s lives. The only book on an author I’ve ever bought I think is about Lermontov, and I don’t imagine there’ll be a huge number more. ps. Remember when A&E used to be good? Nostalgic sigh. My impression is that the new Gatsby isn’t as subdued and low key as Luhrmann’s Moulin Rouge. Snide social commentary, quite. He is very astute. It’s amazing how much he packs in at under 200 pages. That’s how you do state of a nation. You don’t need a doorstop to capture something about a time and a place. Who did Mira Sorvino play? Thanks, Max, for the kind words about my own analysis. It’s true that I always look for symbolic content and mythical interpretations in whatever I read, and I enjoy books of that nature more than others. Gatsby stuck out at me immediately in that regard. I was interested to learn from your review that Fitzgerald wrote the line about the cover after he saw the artwork. I noticed that line and it reminded me of the cover, but I just assumed it was the other way around. I hadn’t thought of the circus implications of the title “The Great Gatsby,” but I think you’re right on. The themes of mortality and money sum things up, although I saw more cosmic implications – those “Eyes of Eckleburg” really impressed me. I was just reading Sam Jordison’s review and it’s amazing how so many people don’t “get” it, and also how many contemporary critics dismissed the book as frivolous and meaningless. But I addressed that a little bit in my review; people’s tastes and educational levels differ so much that no book is going to be universally loved. Parenthetically, I’m in the middle of Robert Graves’ Goodbye to All That and I’m finding it tedious going. Maybe I just don’t like memoirs. I’m past his schooldays and getting into the war and frankly I find the whole thing depressing. In fact, I’ve given it up for the moment in favor of something more to my taste, although I do intend to keep nibbling at it. So I’m certainly not immune, either, to the vagaries of preference. I am of the old school who always thought ‘The Great Gatsby’ was trivial because of its fascination with money and with people who have money. Give me ‘The Grapes of Wrath’ any day. I did The Grapes of Wrath for school, so I can’t read it now. Crawling through its pages, like that turtle in the intercalary chapters, killed it for me. Is a fascination with money necessarily trivial? Fitzgerald shows the huge harm that Tom and Daisy do, it’s not a sympathetic portrayal. Unfortunately, the Toms and the Daisys have a huge impact on our world even now, and likely will for years yet to come and perhaps always. Lorinda, the eyes as the eyes of god or eyes of judgement do stand out. It just wasn’t the theme that most spoke to me this time. I did think you were good on the symbolism and mythic elements, but then I think that’s an area generally you’re very strong on – likely as it’s where your own writing interests lie. Other than the Claudius novels my general impression of Graves is that he’s a very dry writer of prose. I know that one’s much praised, but I’m not hugely surprised by your comment. Sorvino played Daisy, if you can believe it, and totally pulled it off! Toby Stephens was Gatsby and Rudd, Nick. Actually, I can see that. Interesting. I read this as a teenager, I also wanted to reread it before watching the film. I don’t see the link with Le Grand Meaulnes but I guess I don’t remember enough of Gatsby or Meaulnes to really figure out the link. I’m not going to reread Le Grand Meaulnes unless I’m left on a desert island and it’s the only book left. Back to Fitzgerald. I highly recommend Tales from the Jazz Age. I find his style wonderful, full of lightness and seriousness at the same time. He’s funny, perceptive, sharp in his descriptions. A great writer. Sorry Emma, I missed that I hadn’t replied. I’ll check out Tales from the Jazz Age (I would anyway for the title alone, which is marvellous). I could use some lighter reading to intersperse occasionally with the Cervantes (though I need to be careful not to intersperse so much I give up on Cervantes). This brings about another face of the argument: does this apply to Daisy as well? Daisy had been pressured to reject Jay Gatsby back during the war since he was a soldier, and short of money. Daisy came from old money, and didnâ€™t see Gatsby as a suitable mate for her solely on his monetary status. But now that Gatsbyâ€™s â€˜all grown upâ€™ and rich, Daisyâ€™s suddenly in love again. Marius Bewley’s comment (first on the list) works for me. America in general has a love-affair with wealth and beauty. Combine the two, and it doesn’t much matter what’s inside the package. With Daisy, she’s happy to take all of the parties, clothes, happy times, but isn’t going to question much of anything. She shies away from Gatsby not because of the way he made his money but because of his intensity. She and Tom are a good match – neither of them questions their own right to be rich and selfish, and there’s no intellectual curiosity: just desire to be entertained. Gatsby is all energy and goals. Why 3-D, why Gatsby, why now? The movie feels five years too late, after the subprime bubble burst. Though we see our narrator, Nick Carraway (Tobey Maguire), making cold calls on Wall Street, this movie doesn’t look forward to the crash of 1929. Luhrmann makes big, gaudy pictures, but he isn’t a big-picture guy. We see the proles shoveling in the Valley of Ashes, but why there’s such vast income inequality—then as now—isn’t a topic of concern. The director is interested only in love, not money. And his Gatsby (DiCaprio) only uses money as glittering lure to attract his lost love Daisy (Carey Mulligan), which requires shady deals with the gangsters he fronts for.